A child’s disappearance is the catalyst for this savage indictment of family breakdown in contemporary Russia. 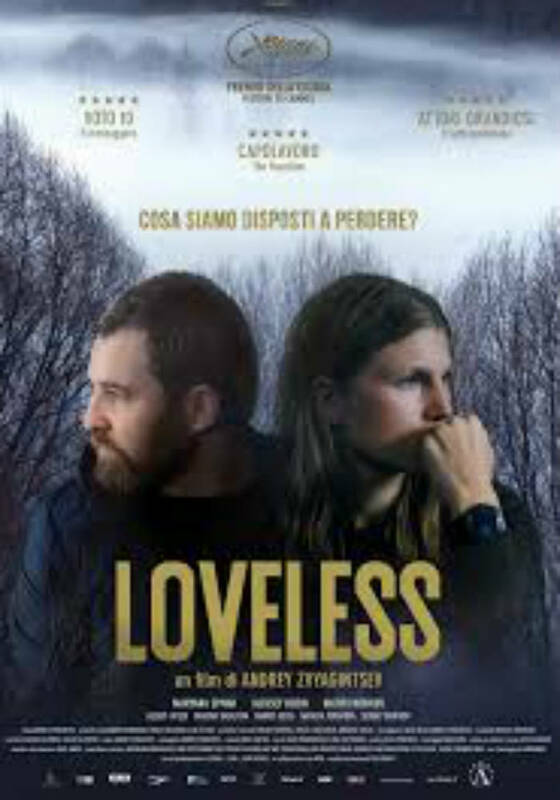 There is an early image in Russian director Andrey Zvyagintsev’s Oscar-nominated Loveless that has haunted me since I first saw the film. A couple in the throes of a messy separation are arguing bitterly about which of them will have to care for their young son, an onerous burden neither wishes to shoulder. As they argue, a door is pulled shut and the camera spies the child, unseen by his parents, standing in the shadows, a white vest accentuating his fragile frame, his face contorted in a silent scream of unloved anguish. It’s a horrifying vision – a snapshot of desolation and despair that shrieks back to the days of pre-sound cinema, to the pure poetry of visual storytelling. It is also emblematic of a film that, with chilly precision, dissects the frozen corpse of a hollow society – personal, national and global. Twelve-year-old Alyosha (Matvey Novikov) is the lost soul at the centre of this drama, which was co-written by Zvyagintsev and his regular collaborator, Oleg Negin. Alyosha’s journey home from school takes him through woods littered with discarded red-and-white cordon tape, suggesting a crime scene or danger zone with the hint of a Grimm fable. Alyosha’s father, Boris (Aleksey Rozin), has taken up with a younger woman who is pregnant with his child. Meanwhile his mother, Zhenya (Maryana Spivak), has embarked on a passionate affair with a wealthy older man who calls her “the most wonderful monster in the world”. And then, like Ian McEwan’s The child in time, Alyosha disappears – although his parents don’t notice until the school calls to report his absence. The police are uncaring and ineffectual (a recurrent theme of Zvyagintsev’s films), and it’s left to a volunteer group to lead the hunt for the boy, interviewing neighbours, scouring the woods, putting up “Missing” posters. The volunteers are decent and driven, their stoical mission at odds with the dehumanising cycle of suburban life. As for the parents, the disappearance of their child merely sharpens their seething resentment, heightening the state of “lovelessness” in which (we are told) one simply cannot live. In his first feature, The Return (2004), Zvyagintsev painted a powerful portrait of father-son estrangement, filmed in the slate-grey hues of a half-remembered dream. With Elena (2012), he turned a rotting domestic drama into an ice-cool study of deadly family ties in a disconnected society. And in 2014’s Leviathan (which, like Loveless, was nominated for the best foreign language film Oscar), Zvyagintsev offered a pointedly poisonous picture of Russia in which ordinary lives are crushed and torn apart by institutional corruption. All these threads come together in this pitiless parable that evokes a purgatorial state, ruled over by uncaring authorities and godless religion. In thrall to the empty aspirations of modern life (“To love and selfies!”), Boris and Zhenya are tellingly described by Zvyagintsev as “an average middle-class couple … devoid of any real self-awareness or doubt”. In this unfeeling, post-industrial environment, happiness is a commodity, just as family stability has become a status symbol. Absurdly, Boris’s boss rules his workplace with a strict Christian ethos; for him, domestic bliss is not a life goal but a job requirement, a facade to be preserved at all costs. Meanwhile, news stations spew stories of “apocalyptic sentiments” and encroaching wars, the background noise of a world in turmoil. As the domestic drama mutates into anxious investigation, so the sense of existential dread amplifies, leading us to the remote lair of an embittered grandparent, and to cavernous abandoned buildings in which lost boys (of which there are many) may take refuge from their toxic home lives. All the while, cinematographer Mikhail Krichman’s camera conducts an investigation of its own, lingering on a crawl space in the roots of a tree, gliding over lonely waters. It’s profoundly uncomfortable viewing: mournful, monstrous and weirdly mesmerising.